Kathmandu Valley’s air pollution threat is mainly caused by vehicular emissions, brick kilns and roadside dust. Of the suspended particles in the air, the most dangerous is the very fine soot from the tailpipes of diesel vehicles, which is a known carcinogen. The fact that air pollution causes respiratory problems is fairly well known. What people are less aware about is how it also causes strokes, heart diseases and cancers. An increase in air pollution means that the population is exposed to more risk. Kathmandu Valley’s air pollution levels are several times higher than what is deemed safe by the WHO. We need to clean up our air, and we need to start doing it right now. The smoke from brick kilns is a threat, but these are being dislodged as land prices soar. Dust is more of an irritant, and has been exacerbated by road construction and the laying of new water mains. Much more serious is the threat posed by vehicular emissions. And the best way to save our lungs is to improve the bus service in the city. So, in that sense, investing in public transportation is actually an investment in public health. Public transport should be the backbone of urban transport system in any big city and should carry at least half of all commuters. 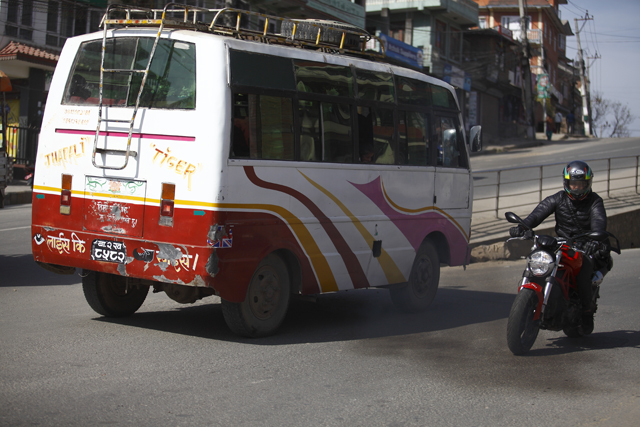 In Kathmandu buses at present only carry 28 per cent of commuters. Private car ownership is still fairly low in Kathmandu, but this is growing at 13 per cent every year, and it is disproportionate to the Valley’s annual population growth of 5 per cent. Widening roads without upgrading the public transport system is counter-productive. In fact, it might just increase pollution by encouraging more people to buy cars. Some roads, of course, need to be widened – not to accommodate more cars but to have bus lanes and space for people. For example, the Ring Road is being widened to accommodate eight lanes but this will only invite more cars on the road. The only way to reduce congestion on the Ring Road is to dedicate two of the lanes to buses. Once public buses begin to whiz past private cars, people will leave their cars and motorcycles at home and commute by public buses. This will then result in a people-centric rather than car-centric city. Public buses will be the most feasible and realistic mass transit system for Kathmandu in the near future. We need a more efficient public transport network not just for efficient commutes, but also for our health and the quality of life we aspire to have.